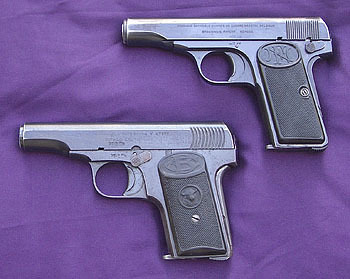 Just as the Model 1900 FN Browning, the first .32 caliber self -loading pistol ever made, set off a wave of imitations, so did the Model 1910 Browning which, with the Colt 1911, is one of the most copied pistols of the 20th century (think Bayard, Bufalo, Danton, DWM, Melior, and the Czech Praga). 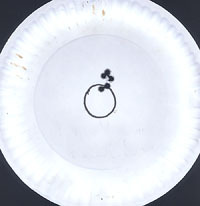 The Model 1910 was one of the first production self-loading pistols with the recoil spring around the barrel. Like the Colt 1903 Pocket Model (also designed by John Moses Browning), it had a grip safety and a thumb-operated manual safety, and added a magazine disconnect safety as well. 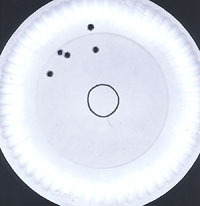 The Model 1910 was manufactured continuously from 1912 to 1983, and is still highly regarded for its accuracy and reliability. All three pistols are single action only. The Walther and the Bufalo have internal hammers, whereas the Browning utilizes a striker. The Walther has no grip safety. John M. Browning, American Gunmaker, John Browning and Curt Gentry, Doubleday & Co., 1964. Spanish Handguns, by Gene Gangarosa Jr., Stoeger Publishing Co., 2001. The Walther Handgun Story, by Gene Gangarosa Jr., Stoeger Publishing Co., 1999.